Remar Sutton has led an eclectic and stimulating life. Many of his adventures—from staging the first American Football game in Europe, writing mystery novels, and authoring a widely-syndicated Washington Post column, to his quest to become a hunk—have been the subjects of books and articles. Sutton’s life story was even optioned by Tri-Star pictures. Sutton’s life story also includes friendships with many iconic Americans, from Walter Cronkite, Peter Jennings, and Andy Rooney to authors Kurt Vonnegut and George Plimpton. In addition to his work as a consumer advocate and an authority on health scams and fraud, Sutton is active in many areas. •He is the author of five fiction and non-fiction books. •Remar Founded the Privacy Rights Now Coalition and the Consumer Task Force for Automotive Issues. •He serves as a U.S. Trustee of the British Virgin Islands National Parks. •Remar is Chairman of the Trustees of the Hearst Castle Preservation Foundation and a member of the Advisory Board of the National Monuments Foundation. •Sutton also served as an Editorial Associate of The Paris Review for 15 years, and served as a member of the Board of Directors of the New York Philomusica Chamber Orchestra for 20 years. •Remar’s Washington Post column on health was syndicated by United Features in many of the nation’s top 100 newspapers, including the Los Angeles Times, The Dallas Times Herald and The Miami Herald. Over the years, Sutton has been a frequent guest or subject with virtually all the major national media: Dateline NBC, Twenty-Twenty, Sixty Minutes, Ted Koppel's Nightline, CNN, ABC Primetime, Good Morning America, TODAY, CBS Morning News, Newsweek, USA Today, The Wall Street Journal, The New York Times, The Washington Post, PBS television's News Hour with Jim Lehrer, and PEOPLE magazine have all featured Sutton as either an on-air authority, consultant, or subject. Sutton spends the winter months at his home in the British Virgin Islands and the summer months at his home in Denmark. Remar Sutton first wrote about Dan Buettner in Sutton’s syndicated Washington Post column in 1986. Dan was 26 and Remar was 45. Thirty-one years later, Remar has remained a participant and eyewitness to the events that shaped Buettner’s interests in health, long life, and happiness. Sutton and Buettner have become lifelong friends, and Sutton has seen his own health and life habits shaped by the Blue Zones principles. The Blue Zones Back Story: Sutton’s talk, “The Blue Zones Back Story” takes you to the very beginning of the Blue Zones expeditions through Sutton’s national role as a skeptic and critic of health scams and frauds. It includes anecdotes about and lessons learned from legendary Americans your audience will know simply by their family names, including Cronkite, Rooney, Jennings, Eisenhower, Kennedy, Plimpton, Rockefeller, and Vonnegut. 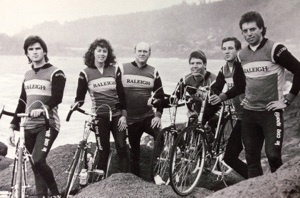 A NON-JOCK’S STORY: Remar Sutton was never a jock or health nut. At 76, he is living proof that the Blue Zones principles can be adopted and enjoyed by all of us. Sutton’s Blue Zones talks include an action plan incorporating the Blue Zones Power Nine principles into a life plan for businesses, communities, and individuals. Or visit the Blue Zones Speakers Page. 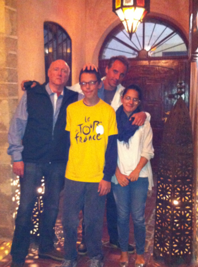 Marrakesh, Morocco was the scene of this reunion with Remar, Rafa, Dan, and Irene. Cronkite and Sutton at anchor in St. Barts in 2006. Walter was 89 at the time, and “Believe you me, Walter was definitely still the captain of the ship!” says Sutton. “I’ve never known two more forward-thinking people than Walter Cronkite and Andy Rooney,” Sutton says. 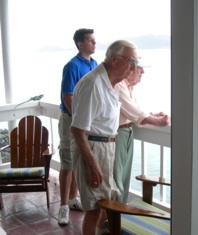 “Even into their 90’s, they started every day with a curious mind and a taste for an adventure.” Here, Dan Buettner’s oldest son (Dan jr.) joins Cronkite and Rooney watching surfer’s from a balcony at Sutton’s BVI home. 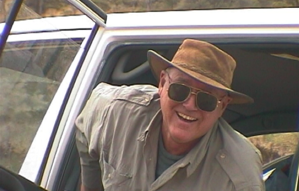 Sutton arrives in the great Outback to document Dan Buettner’s Australian expedition for The Washington Post. Remar Sutton (middle) and Dan Buettner (right) moments before striking off on Dan’s first expedition from the westernmost tip of Alaska to the southernmost tip of South America. Peter Jennings and Kayce Freed Jennings with Remar about Cronkite’s Sailing Yacht, the Wyntje. 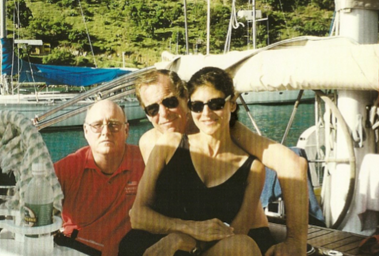 Both Cronkite and Jennings served with Remar as Trustees of the BVI National Parks, USA.